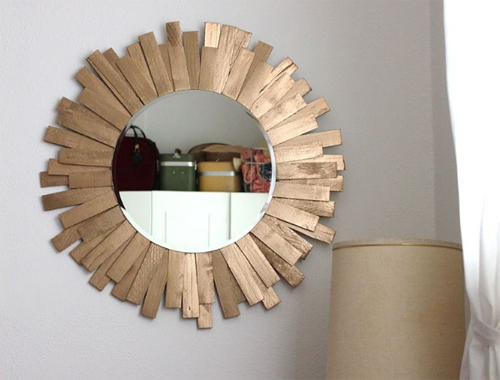 She Used Hot Glue And Slim Pieces Of Wood To Create This STUNNING Starburst Mirror! She wanted to incorporate a metallic gold into her room decor, and the thought of using a mirror to make it happen ended up being the perfect idea! She made the entire thing from scratch by purchasing each piece separately, but if you happen to have a circular mirror lying around, you might be able to use the existing frame to create something similar. 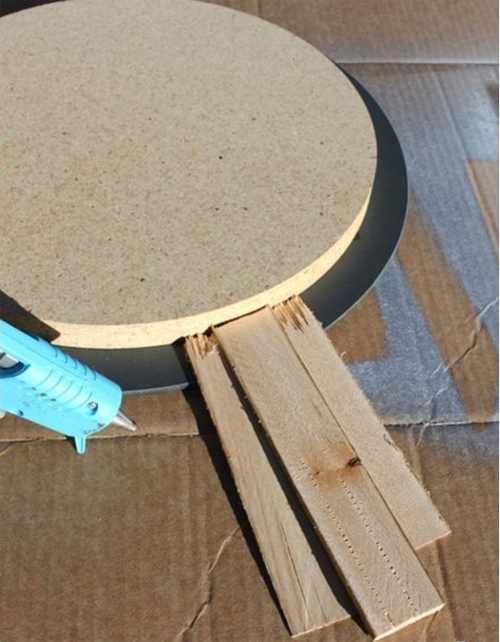 Using a strong wood glue, she attached this round piece of wood to the back of her circular mirror. You won’t want the entire thing crashing to the ground during dinner, so this step is very important! The extra inch or so left between the edge of the wood and the mirror is where you’ll be attaching your pieces of wood to create the starburst pattern. Made with shims, she broke them in half to create these varying lengths. The splintered edges were concealed behind the mirror and the straight edges were arranged with the longer pieces at the very back. After painting them with primer and a metallic spray paint, the finished piece hangs beautifully in the bedroom. It would also look amazing above a fireplace or on the landing of the stairs! Where would you hang yours? If you plan to make something like this yourself, you can see the full tutorial here!